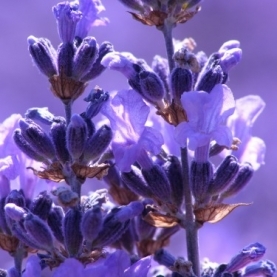 Lavender –Lavandula angustifolia 5.6-5.9 Ideal for every skin type, because of it’s balanced pH. It has a regenerative quality that is effective for damaged skin. Great to combat a dry environment-mist on the face & neck throughout the day. Reduces inflammation after shaving. Calming to sunburn, bug bites, heat rash & itching. Use as a room spray to bring about a sense of calm. Refreshing & cleansing. Use on the abdomen for PMS and cramping. Helpful for hot flashes, especially when combined with peppermint, also great for headaches, stress & tension. Cistus - Astringent, styptic & cicatrisant. A wonderful for healing scars & wounds. Stops bleeding on contact. Use as a wrinkle treatment. Helpful for bleeding ulcers, internal bleeding & ulcerative colitis. A powerful douche for endometriosis, when used daily & combined with Helichrysum. Rose centifolia - Rosea centifolia Astringent, Cooling. Relieves stress, comforts the spirit, strengthens the heart. Hormone balancer, addresses PMS, moodiness & cramping. It’s humectant properties make it beneficial for dry, mature & sensitive skin. It has anti wrinkle properties and makes a wonderful room & body spray. It is helpful in a post partum sitz bath. A great hydrosol to keep in your first aid kit. Rose has an affinity to the heart & the emotions, it is beneficial for the mind, body & spirit. Assists with self love. Rose Geranium – Pelargonium capitatum pH 4.9-5.2 Adaptogenic, hemostatic, anti-inflammatory, humectant & balancing, a very popular hydrosol for all skin types, of all ages. Use for rough & dry skin on the elbows, knees & heels. Cooling to all heat conditions that affect the skin: rashes, broken capillaries, rosacea, bug bites & sunburn. Used internally for hot flashes, has a balancing effect on the endocrine system & the emotional body. Add to fruit based sweets, sauces or a martini.